Introduction: Almost 90% of chronic obstructive pulmonary disease (COPD) deaths occur in low- and middle-income countries (LMICs), where there are large rural populations and access to health care for COPD is poor. The purpose of this study was to compare urban-rural provider experiences regarding systemic facilitators and barriers to COPD management and treatment access. 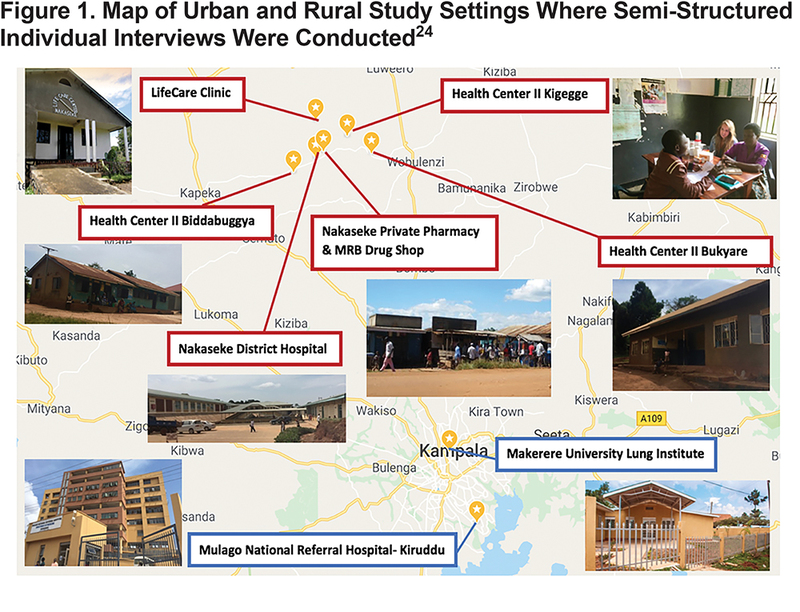 Methods: We conducted a qualitative study using direct observations and in-depth semi-structured interviews with 16 and 10 health care providers in urban Kampala and rural Nakaseke, Uganda, respectively. We analyzed interviews by performing inductive coding using generated topical codes. Results: In both urban and rural districts, exposure to evidence-based practices for COPD diagnosis and treatment was limited. The biomedical definition of COPD is not well distinguished in rural communities and was commonly confused with asthma and other respiratory diseases. Urban and rural participants alike described low availability of medications, limited access to diagnostic tools, poor awareness of the disease, and lack of financial means for medical care as common barriers to seeking and receiving care for COPD. While there was greater access to COPD treatment in urban areas, rural populations faced more pronounced barriers in access to diagnostic equipment, following standard treatment guidelines, and training medical personnel in non-communicable disease (NCD) management and treatment. Conclusion: Our results suggest that health system challenges for the treatment of COPD may disproportionately affect rural areas in Uganda. Implementation of diagnostic and treatment guidelines and training health professionals in COPD, with a special emphasis on rural communities, will assist in addressing these barriers. Funding: This research was funded by the Medical Research Council Grant MR/P008984/1 under the Global Excellence in COPD Outcomes study and the Irvin F. and Alice S. Etscorn International Summer Research Award. Past research in sub-Saharan Africa has documented differences between urban and rural health care. More specifically, these studies have explored urban-rural differences in health care access, health care service utilization, treatment-seeking behaviors and location of providers and services.20,21 However, few studies conducted in sub-Saharan Africa have specifically studied gaps in management and treatment in populations with CRDs in relation to urban-rural differences, and none to our knowledge have examined differences in Uganda.22 The aim of this qualitative study was to compare urban and rural provider experiences to explore the systemic facilitators and barriers to COPD management and treatment access between urban Kampala and rural Nakaseke, Uganda. The study involved semi-structured interviews with health care providers at 6 government-sponsored health care facilities, 1 private health care center, and 2 private pharmacies. These health centers offer varying services in levels of care and health care provider qualifications. Nakaseke District Hospital, a level V government health center (district hospital), provides the most specialized care offering outpatient care, inpatient health services, emergency surgeries, maternal care, and laboratory services. Bukyare, Biddabuggya, and Kigegge Health Centers were headed by nursing officers and offered preventative, promotive and outpatient curative health services, which classifies these facilities as level II health centers.23 LifeCare clinic, a private health center funded by the non-governmental organization ACCESS Uganda, offered inpatient, outpatient, and laboratory services. Nakaseke Private Pharmacy and MRB Drug Shop are both privately owned pharmacies in the center of the Nakaseke district.23 In Kampala, Mulago National Referral Hospital-Kiruddu, the most specialized government health care facility in Uganda, and Makerere University Lung Institute, a lung research center, were chosen as urban study sites. The distribution of study site locations is pictured in Figure 1. Our study was conducted from August to December 2017 in urban Kampala and rural Nakaseke, Uganda. Purposeful sampling is a technique used to identify and select participants who are deemed knowledgeable about or experienced with a topic of interest. This sampling technique was performed at private- and government-funded health centers in Nakaseke and Kampala sites where providers were known to treat non-communicable disease (NCD) patients and with which the research team members had prior relationships. Snowball sampling is a technique in which additional participants are identified and recruited by the existing participants in the study sample, e.g., neighbors, friends, or family members. This sampling method was performed from key informants to find additional health care providers. To be eligible to participate, health care providers had to have practiced in the study district for a minimum of 1 year. A team of researchers trained in qualitative research methods conducted a total of 26 semi-structured in-depth interviews with health providers, including physicians, clinical officers, clinical officer students, medical officers, residents, physician assistants, nurses, nursing students, and pharmacists throughout both Kampala and Nakaseke. The study team also conducted 10 observations over 1 week at various health centers in Nakaseke and Kampala before interviews were conducted. Observations were recorded as field notes and memos commenting on health center capacity, provider-patient interactions, daily operations, and provided the research team with context for probing during semi-structured interviews and participant responses. Twenty-five out of 26 interviews were conducted in English, while 1 interview was conducted in Luganda. Interviewers used a semi-structured interview guide including open-ended questions about knowledge and perceptions of chronic respiratory diseases and specifically probed about COPD causes, diagnostic practices, management, medication availability, and treatment guidelines. Additionally, the interviews focused on examining how provider experiences in an urban or rural setting influenced COPD prevention, diagnosis, management, treatment, and patient health outcomes. Interviews lasted approximately 45 minutes (range 30 to 60 minutes). This study was approved by the Johns Hopkins Bloomberg School of Public Health Institutional Review Board, the Uganda National Council for Science and Technology (SS 4283), and Makerere University School of Medicine Research Ethics Committee (2017-096). Verbal, informed consent was obtained prior to each interview. Participation was voluntary, and interviewees could stop at any time during the interview. All interviews were audio-recorded and transcribed verbatim by the research team. Participant observations lasted approximately 1 hour at each health center and direct observations were recorded in field books. After verbatim transcription, the research team reviewed transcripts individually. Through discussions and reflections on interview transcripts and observation field notes, an initial codebook was developed using Grounded Theory, an inductive methodology in which data are interpreted with a few questions developed a priori.25 The codebook was entered into Dedoose, a web application for research.26 Topical codes included awareness and lack of awareness of COPD; causes, community representation, symptoms, diagnosis, management, and treatment of COPD; social barriers to care; physical and financial barriers to care; systemic barriers to care; facilitators to care; COPD outcomes; patient-provider relationships; patient pathways; and COPD impact. The remaining data were analyzed using the topical codes that emerged from participant interviews and were later sorted into larger thematic groups of barriers and facilitators to COPD management and treatment access in both urban and rural settings. All participants approached agreed to participate in individual interviews. We interviewed 16 rural providers in Nakaseke and 10 urban providers in Kampala. Of the providers, 14 were female. Participants represented a variety of health care professions including 2 drug dispensers, 1 pharmacist intern, 2 pharmacists, 1 nursing student, 3 enrolled nurses, 4 nursing officers, 1 clinical officer student, 6 clinical officers, 3 medical officers, and 3 physicians. See Table 1 legend for descriptions of each health care profession. Overall awareness of COPD was limited in both urban and rural settings; however, results suggested that rural providers had lower awareness of COPD. This was coupled with limited access to COPD diagnostic tools (spirometry), poor utilization of COPD treatment guidelines, inaccessible COPD treatment medications, and lack of specialized care in rural areas. 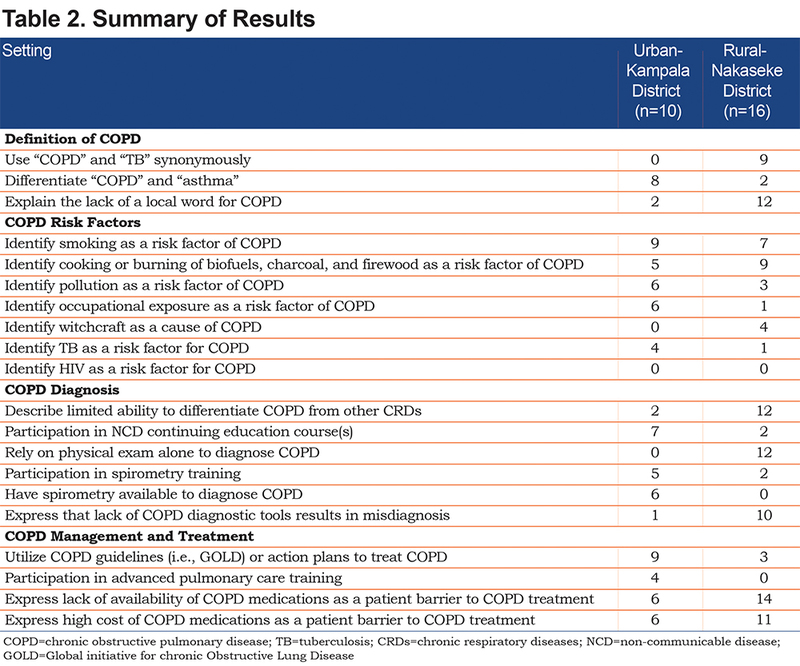 See Table 2 for a summary of urban and rural provider responses comparing awareness, risk factors, diagnosis, treatment, and management of COPD. Both rural and urban providers described COPD as the same disease as tuberculosis and other chronic respiratory diseases such as asthma, fibrosis, and chronic bronchitis. Urban and rural providers also explained that many of their patients also explained COPD as the same as other respiratory diseases: “[With]COPD, they [urban patients] think they have asthma. Because COPD is not usually known…” [Urban Nursing Officer]. Twelve rural providers and 2 urban providers explained that the lack of a Luganda word for COPD limited community awareness and diagnosis of COPD. Furthermore, many rural providers used “COPD” and “asthma” synonymously, as “asthma” is the term frequently used in rural communities such as Nakaseke to explain a disease caused by breathing in smoke and pollution: “They [community members] use asthma. They know asthma” [Rural Clinical Officer]. “Majorly it is the risk factors that play a role. You find in urban patients many of them have been smokers. While in the rural areas many of them have been using biofuels, firewood for cooking. For the men [in urban settings] you find some of them have been working in sugar factories. They have been exposed to those fumes." [Urban Medical Officer]. Most participants described urban COPD causes in terms of smoking, industrial occupational exposures, and living in an urban environment with pronounced air pollution: “It is the smoke and some of it is the occupational hazards: the factory, working in the millers…” [Urban Nursing Officer]. In rural settings, providers mentioned habitual practices, such as cooking over a fire, burning firewood, and smoking, as the primary causes of COPD: “There may be a history of smoking. 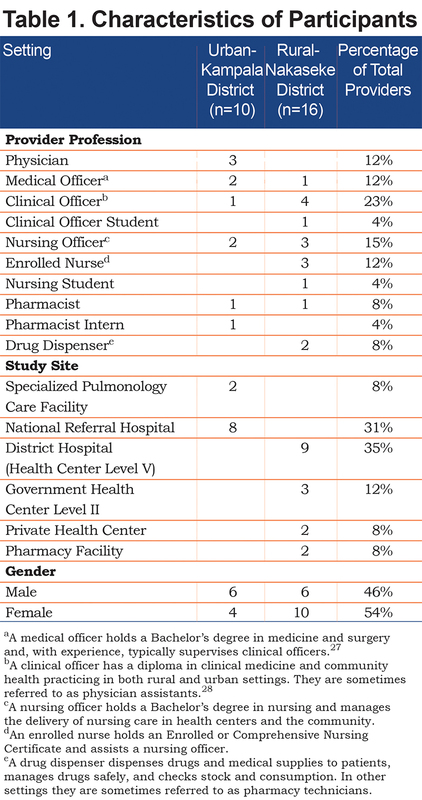 That is a very common feature among these…almost all [rural] patients” [Rural Clinical Officer Student]. Another rural provider further elaborated on household behaviors that cause COPD in rural settings: “They smoke, and they burn charcoal. Some elderly women I think… they are using firewood in cooking. Some people when they are cooking…those people are using a charcoal stove... in their house” [Rural Clinical Officer]. Additionally, 4 urban providers and 1 rural provider identified TB as a risk factor for COPD: “Respiratory infections like tuberculosis, can predispose people to COPD” [Urban Physician]. Four rural providers also mentioned that their patients described witchcraft as a cause of COPD and other respiratory illnesses. When rural providers were probed about what individuals in the community thought caused respiratory illness, one provider said: “The beliefs… we still have the belief they are being bewitched and some of them even first visit traditional healers….sometimes they believe there are some little charms and then they go and visit traditional healers” [Rural Senior Clinical Officer]. “I: Have you ever performed spirometry yourself or…? I: Have you seen it? I: Do you know what it … what it does? Many urban and rural providers alike expressed that diagnosis was inhibited more by lack of diagnostic tools and training rather than knowledge gaps. Participants explained further that the lack of diagnostic tools and training with these tools makes differential diagnoses between COPD and other respiratory conditions difficult. Ten rural providers expressed concern that these barriers could lead to misdiagnosis or poor health outcomes due to lack of COPD diagnostic tools compared to in urban settings. One participant expanded on this idea saying: “In the rural areas the level of management is different….in the villages with clinical officers they don’t have the means to manage it. In rural areas some of them miss it and leave it. You go [from the health center] and without them diagnosed rightfully” [Urban Pharmacist]. Both urban and rural providers attributed lack of differentiation between COPD and other respiratory diseases, causing a misdiagnosis of COPD, to most likely the lack of diagnostic tools and COPD-related training. At urban health centers - Mulago National Referral Hospital and the Makerere University Lung Institute - providers reported access to advanced diagnostic tools to confirm a COPD diagnosis. One medical officer described the diagnostic process that occurs in an urban hospital in Kampala: “Here [in urban settings] we actually take a detailed history and then after taking a detailed history we examine them and here we are able to do a chest x-ray, we [are] able to do a sputum examination, and we are able to do a lung function test, spirometry for example” [Urban Medical Officer]. Furthermore, an urban provider with prior experience practicing in rural settings, emphasized how access to COPD medications and diagnostic tools is one of the major differences in COPD management between urban and rural settings, as access acts as a predictor to patients’ lung health outcomes: “I think the biggest thing is access to care, access to medicines, access to the doctors that will diagnose, access to the investigations which will help diagnose COPD….All of these access points are available in the urban setting...You can’t find everything in a rural setting. You don’t have [them]. You will even be lucky to find a doctor in the rural setting who knows how to manage COPD” [Urban Physician]. Regarding COPD treatment, participants explained the lack of COPD guidelines in rural areas, while urban providers commonly described referring to COPD guidelines to categorize COPD severity and thus inform COPD treatment. When asked if COPD treatment guidelines or action plans were utilized, one rural participant said: “No. I don’t think [so]. They are not” [Rural Clinical Officer]. However, in urban areas, COPD treatment guidelines were available and commonly utilized. An urban provider explained, “We [urban providers] actually practice something here called the GOLD criteria, that is what we use here for actually assessing their risk" [Urban Medical Officer]. However, in rural areas of Uganda, participants attributed the absence of COPD management guidelines to the lack of awareness of COPD. When asked if COPD treatment guidelines or action plans were used, one participant said: “Perhaps I have not seen any…there are no guidelines” [Rural Nursing Student]. Additionally, our findings suggest that physicians and providers with specialized training and knowledge of advanced pulmonology treatment guidelines exist in urban centers in Kampala, but not in rural, “up-country,” health centers, such as in Nakaseke. An urban provider described: “It [COPD treatment access] is worse because if I stay up-country, and I need to see a chest physician -- there is only one in Kampala, or 2 or 3. Seeing the up-country, they have no specialized training towards COPD. I can’t keep coming to Kampala from 200 or 300-km away. I will keep seeing my nurse or nurse assistant or clinical officer” [Urban Physician]. Regarding medication use for COPD treatment, the cost, price and availability of medications were found to be the most common barriers to abiding by COPD treatment regimens in both urban and rural settings. While the lack of availability of medication to treat COPD symptoms was a major barrier to care in both urban and rural areas of Uganda, providers from urban health centers expressed the presence of a greater number of pharmacies with inhalers and higher socioeconomic means of urban dwellers to purchase inhalers. While providers working in urban areas explained a “preferred course of treatment” for patients with COPD, which included inhalers, long- and short-acting, and oral steroids, one provider from a rural health facility explained the difficulty in obtaining access to medications (specifically inhalers) for patients with respiratory illnesses: “We don’t have [the COPD medications]. Even for us [rural residents] the cost can be high” [Rural Medical Officer]. The systemic barriers between urban and rural settings are compared in Figure 2. The results of this study suggest that in both the Kampala and Nakaseke districts many providers do not consider COPD a distinct illness due to the lack of diagnostic tools and training to recognize and differentiate COPD from other respiratory diseases. The diagnosis of COPD requires access to quality-assured post-bronchodilator spirometry, and international strategy documents such as the Global initiative for obstructive Lung Disease (GOLD), which could aid in the implementation of local diagnostic and treatment guidelines.1 These findings are consistent with other literature in demonstrating the lack of awareness of COPD and its risk factors among rural populations in sub-Saharan Africa.7,12 The lack of COPD knowledge in rural areas of Uganda can be largely attributed to the different explanatory models of COPD among rural populations in Uganda instead of the biomedical model of COPD. This may result in a lack of adherence or biomedical knowledge of guidelines to manage COPD. We also found that increased COPD knowledgein urban areas appeared to be due to more NCD training and more developed health infrastructure that facilitated diagnosis and management of COPD according to guidelines. This study is the first, of our knowledge, to examine urban-rural differences in knowledge, attitudes and practices concerning COPD in sub-Saharan Africa. Our findings indicate that COPD diagnosis in rural settings was hindered by lack of NCD- and COPD-trained health professionals and specialized diagnostic tools, which was not the case in urban settings. The lack of differentiation between COPD and other respiratory diseases, such as TB and asthma, may be attributable to insufficient diagnostic tools and lack of treatment differentiation between COPD and other CRDs in rural settings. In addition, due to the low awareness of TB and the lack of awareness of HIV as risk factors for COPD among study participants, these factors could also contribute to under-diagnosis of COPD in Uganda, a country with a high burden of TB and high prevalence of HIV.32-34 As a result, many rural providers do not have the means or incentive to distinguish CRDs and all CRDs are diagnosed and treated as the same. Urban settings were perceived by providers to have increased access to physicians with training in pulmonary care and treatment of COPD enabling urban providers to discern CRDs and adequately diagnose COPD. In comparison, rural providers did not have COPD treatment and management training or diagnostic tools, which resulted in their lack of recognition of chronic respiratory symptoms as being attributed to COPD. In urban areas, these perceptions, access to diagnostic tools, and increased biomedical knowledge of COPD as a disease, could explain why providers considered health-seeking behaviors to be more common in urban populations. This finding supports other literature published on COPD in sub-Saharan Africa, such as the FRESH AIR study conducted by van Gemert et al in Masindi, Uganda, which found that rural populations perceived that urban dwellers were favored by health care providers over rural residents.12 Likewise, other LMICs have documented obstacles that hinder individuals with CRDS such as COPD from receiving access to effective care.35 Similar to our findings, these barriers in accessing effective care for chronic respiratory symptoms include lack of available trained medical personnel, lack of diagnostic tools to diagnose COPD, lack of COPD guideline utilization, and little to no access to affordable COPD medications, suggesting that our findings are transferrable to LMIC settings outside of sub-Saharan Africa. The Ugandan Ministry of Health has focused its national health care agenda on non-communicable disease surveillance by administering the STEPS survey, a 2014 population-based study to map NCD risk factors.36 Regarding CRDs, more specifically, the 2016 Ugandan Clinical Guidelines, derived from recommendations from the World Health Organization and other international guidelines, now outline COPD causes, clinical features, investigation, management, and specific treatment for exacerbations and COPD based on its severity level while considering resources available in Uganda.15 These guidelines provide evidence-based recommendations to combat COPD in a resource-poor setting and further promote the Ugandan Ministry of Health’s agenda of prevention and control of NCDs. While these guidelines may be published, efforts should be made to incorporate COPD treatment and management guidelines into continuing education courses and resources for rural providers. In light of the Ugandan Ministry of Health’s prioritization of NCD and COPD treatment, management and prevention alike, our study is salient in highlighting potential urban-rural disparities in COPD management and treatment access. There were several study strengths and limitations. Data collection took place in natural settings at the providers’ workplaces providing a conducive environment for health care providers to openly express themselves and share their experiences. One limitation was the first author’s inability to speak the local language of Luganda, which resulted in all but one interview being conducted in English. By conducting the majority of the interviews in English, participants may have failed to elaborate on responses, compared to if interviews were conducted in the participants’ native language. It is also possible that snowball sampling in Kampala may have yielded providers with greater knowledge of COPD, as health professionals in Kampala health facilities may have more knowledge than those from other urban health centers. Four of the urban participants were trained in some capacity by Bruce Kirenga, MBChB, MMed, a pulmonologist and author of this study. Currently there are 4 active, trained pulmonologists in Uganda, with all of them practicing in urban Kampala. As a result, our sample of urban providers may have had more training in COPD than most comparable health care providers in Kampala. Moreover, there are currently no pulmonology training programs in Uganda, so physicians must seek pulmonology training outside of Uganda by pursuing international fellowships. As the burden of COPD grows in the coming years in LMICs, there will be a greater need to understand urban-rural differences to mitigate potential inequities in COPD prevalence and care. As CRDs require long-term commitment, health care delivery in LMICs must develop strategies to address how to combat these challenges, how to increase awareness of COPD, and how to generate long-term solutions to treat acute respiratory symptoms and manage potentially lifelong conditions. While there have been recent strides in establishing centers devoted to COPD care in urban areas of sub-Saharan Africa, such as the Makerere University Lung Institute in Kampala, few centers exist in rural areas where the vast majority of COPD burden afflicts. Implementation of diagnostic and treatment guidelines will require addressing these known barriers to care with a special emphasis on rural settings. We greatly acknowledge the health care providers who volunteered their time and made this study possible. A special thanks to the study sites-- Nakaseke District Hospital, LifeCare Clinic, HCII Kigegge, HCII Bukyare, HCII Biddabuggya, Nakaseke Private Pharmacy, MRB Drug Shop, Mulago National Referral Hospital, and Makerere University Lung Institute--for allowing us to conduct interviews at their facilities with their providers. We would also like to acknowledge Dr. Patricia Alupo, Faith Nassali, and our research assistant Rebecca Akello for their involvement in this study. This research was generously funded by the Irvin F. and Alice S. Etscorn International Summer Research Award and the Medical Research Council Grant MR/P008984/1 under the Global Excellence in COPD study. Author Contributions: Study concept and design was conducted by Nicole Robertson, Emily Nagourney, Trishul Siddharthan and Bruce Kirenga; Analysis and interpretation was provided by Nicole Robertson, Emily Nagourney and Trishul Siddharthan. Manuscript drafting for important intellectual content was provided by Nicole Robertson, Emily Nagourney and Trishul Siddharthan. Revising the manuscript for important intellectual content was provided by all authors. 1.Global Initiative for Chronic Obstructive Lung Disease (GOLD). 2017: Global Strategy for the Diagnosis, Management and Prevention of COPD. GOLD website. https://goldcopd.org/gold-reports-2017/ Published in 2017. Accessed July 2018. 9. World Health Organization (WHO). The top 10 causes of death. WHO website. https://www.who.int/news-room/fact-sheets/detail/the-top-10-causes-of-death Published 2016. Accessed December 2018. 13. Siddharthan T, Grisby MR, Morgan B, et al. Chronic respiratory disease and the urban divide: a population-based study examining prevalence and attributable risk factors for chronic respiratory disease in Uganda. Am J Resp Crit Care Med. 2017;195:A1390. 14. World Bank. Rural population United Nations Population Division World urbanization prospects.World Bank website. https://data.worldbank.org/indicator/SP.RUR.TOTL?view=map Published 2016. Updated 2018. Accessed July 2018. 15. Ugandan Ministry of Health. Uganda Clinical Guidelines 2016: National Guidelines for Management of Common Conditions. Uganda Ministry of Health website. https://health.go.ug/sites/default/files/Uganda%20Clinical%20Guidelines%202016_FINAL.pdf Published 2016. Accessed July 2018. 19. Obaseki DO, Ozoh OB, Oyewo AH, et al. A preliminary assessment of the impact of a continuing medical education program on the knowledge of Nigerian pulmonologists regarding the management of chronic obstructive pulmonary disease. West Afr J Med. 2015;34(1):32-36. 22. Brundisini F, Giacomini M, DeJean D, et al., Chronic disease patients' experiences with accessing health care in rural and remote areas: a systematic review and qualitative meta-synthesis. Ont Health Technol Assess Ser. 2013;13(15):1-33. 23. Ugandan Ministry of Health, Health Facility Interview. 2012, Ministry of Health: Kampala. 24. Google Maps. 2008 Uganda. Google maps website. https://www.google.com/maps/@0.7583337,32.1593538,9z Published 2018. Accessed July 2018. 25. Charmaz K. Constructing Grounded Theory: A Practical Guide Through Qualitative Research. London: Sage Publications Ltd.;2006. 26. SocioCultural Research Consultants, LLC Dedoose. 2017--web application for managing, analyzing, and presenting qualitative and mixed method research data. Dedoose website. https://www.dedoose.com/ Published 2017. Accessed July 2018. 33. World Health Organization (WHO). Global tuberculosis control report-2009. WHO website. http://apps.who.int/iris/bitstream/handle/10665/44241/9789241598866_eng.pdf;jsessionid=2EFFBFCF276EFE8A38AA172FA2C39A5D?sequence=1. Published 2009. Accessed July 2018. 36. Ugandan Ministry of Health, World Health Organization (WHO). Non-communicable disease risk factor baseline survey—Uganda 2014 report. WHO website. http://www.who.int/ncds/surveillance/steps/Uganda_2014_STEPS_Report.pdf Published 2014. Accessed July 2018.